We can supply Flubenvet for chickens which are not kept as a commercial enterprise and it is the ideal worm treatment for "back-yard" birds. It is safe to eat eggs from treated birds even during treatment. Flubenvet kills worms and their eggs and is a sensible measure for any previously untreated free-range bird which is showing non-specific illness, or where worms are diagnosed or suspected. WE CAN ONLY SUPPLY FLUBENVET FOR DOMESTIC BIRDS. The amount of Flubenvet used is based on the weight of the feed, not of the animal. For example, 60 g of product (the whole tub) medicates 20 kg of feed. See below for more information. 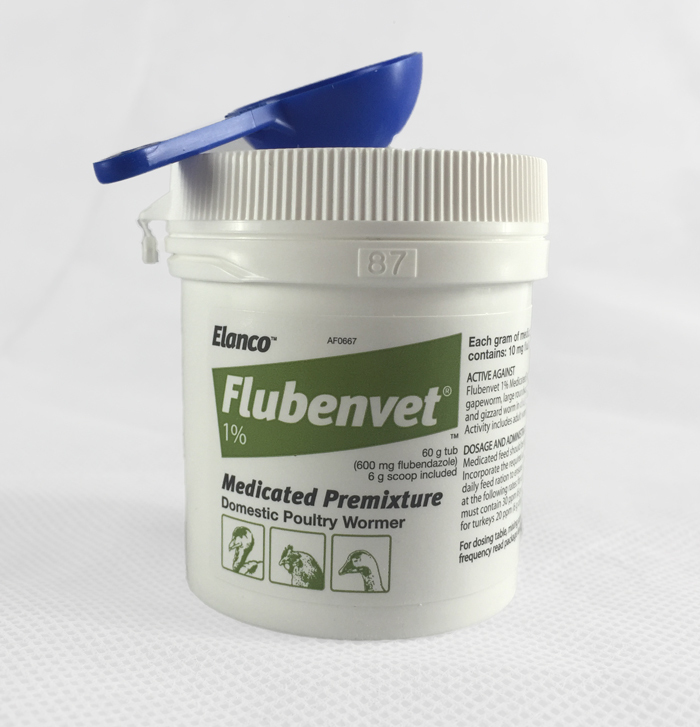 Flubenvet is provided with a handy small scoop so that the correct amount can be added to food. Treatment is normally continued daily for 7 days, then repeated 3 weeks later. Free-range chickens should be kept in as large an area as possible, for welfare reasons and to reduce the parasite build-up on the ground. Moving the birds to a fresh area is also a big help, and ideally is combined with a worm treatment to help keep the new ground clean. 6g of product medicates 2 kg of feed. Feed use over 7 day period (kg) divided by 0.33 = Flubenvet required for whole flock over 7 days (g). Below are some recent questions we've received regarding Flubenvet Wormer, including answers from our team. What is the shelf life of Flubenvet 1% in a 60g tub please? And what is the expiry date on your current stock? Thanks. I am sorry that a broached shelf life has not been established for Flubenvet 1%. It was originally designed to be used on large poultry units where the whole tub would be used as soon as it was opened. We have made our regulatory team aware that today's users would find a broached shelf-life useful and believe they are working on a solution. Store in tightly closed original containers. The product will remain stable in the finished feed for eight weeks." Can you still rather the eggs after working your ducks and geese or do you have to wait? The withdrawal period stated on the tub is nil for eggs from laying hens. This means that you can continue to eat eggs whilst your chickens are being wormed. How often do you worm chickens with Flubenvet? Ideally you should worm with Flubenvet every 12 weeks to 3 months. Can I use Flubenvet on a 4week old pheasant chick. She was gaping earlier today? There is no age guideline on the product, but it does give a week-by-week feeding guide starting from 3 weeks of age, so we would assume this is when it's safe to start worming. How many birds would one pot treat. The amount of Flubenvet used is based on the weight of the feed, not of the animal. For example, 60 g of product (the whole tub) medicates 20 kg of feed. Hi is this any good for getting rid of gape worm. This is the only wormer that will kill gapeworm, so should definitely be used if gapeworm is suspected. what are the types of worm this works for, and is it effective on gapeworm? Yes, Flubenvet is effective against gapeworm, large roundworm, caecal worm, hairworm, and gizzard worm in chickens, turkeys, and geese. Activity includes adult worms, larvae and eggs. Will they still be able to have salad? It is more effective if you only provide the medicated feed while treatment is being given. That is what I would have to suggest just for this time. Yes, it is important to worm your chickens for prevention or cure. As long as they are kept for Noncommercial purposes only. Worms can cause all types of problems in chickens such as weight loss, increased seed consumption and in severe cases amnesia. It's important to worm regularly and ensure that the appropriate procedures are carried out in the environment they are kept to kill any worms in the soil. Flubenvet will help kill worms and their eggs. It is recommended to worm chickens with Flubenvet every 3 weeks. Is flubenvet suitable to use with ducks? Hi ive got runner Ducks with my chickens that share the same food, is it safe to use flubenvet on them aswell as the chickens please? Also I was told about a stronger % flubenvet product possible 2.5% is this something that is available do you know? Ive got 31 chickens and 10 ducks. How long do you dose for? & how often should I be worming please? 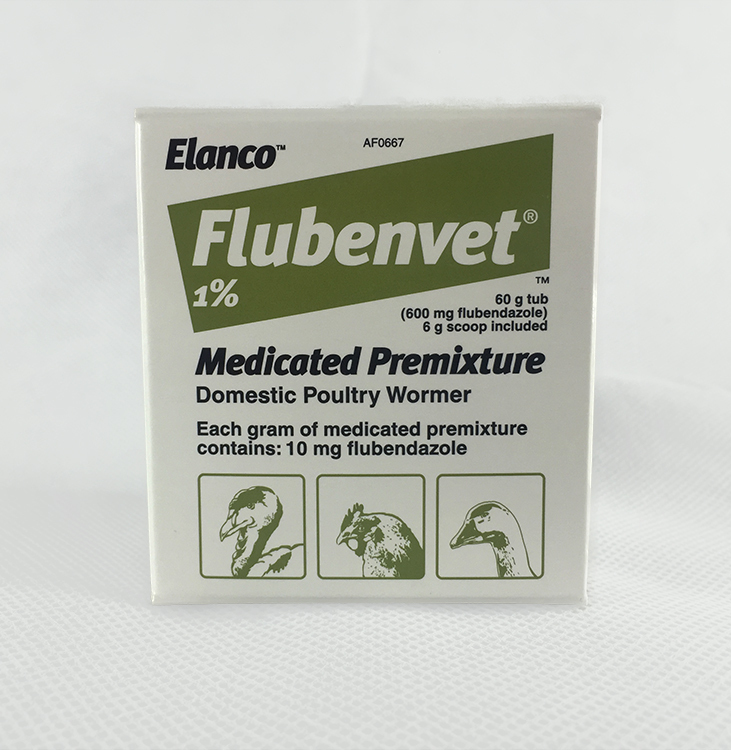 Flubenvet is regarded as a safe and effective wormer for ducks. It is normal to feed for one day to give a worming dose and this should be repeated at least twice a year, depending on how crowded the birds are and if there are young birds present (which tend to suffer more with worms). Frequency of worming requirement will always vary from one establishment to another so fixed recommendations cannot be given. Best to talk to your vet about this if you are not sure. 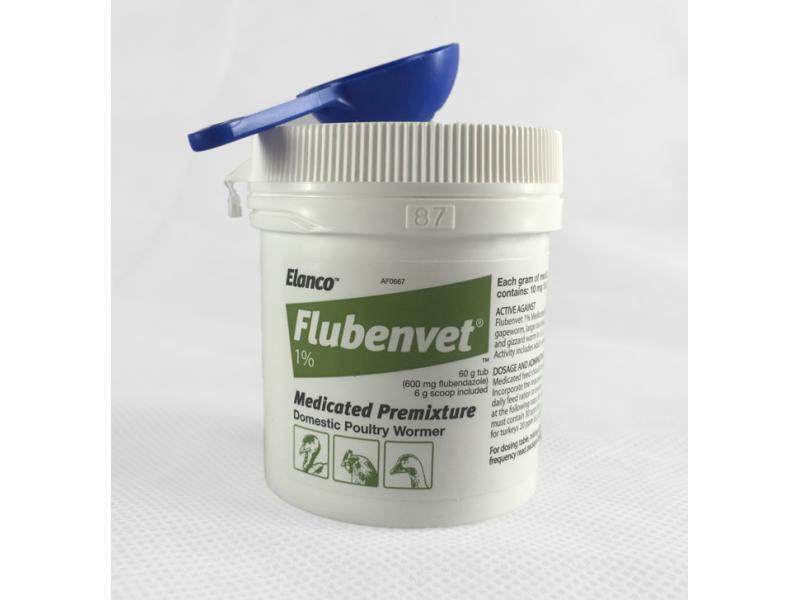 The larger size of Flubenvet is only available for commercial flocks due to rather odd legal restrictions.